Do you remember the last words spoken by your ex-boyfriend or ex-girlfriend, the final advice given in your senior year by your favorite teacher, the words spoken by your mother or father as you left for college? These important moments ended a passage in your life; thus, they took on heightened significance and resonated long after they were spoken. In the same way, a good conclusion continues speaking to and resonating with a reader long after he or she has finished reading it. If you choose this common type of conclusion, be sure to synthesize, rather than merely summarizing. 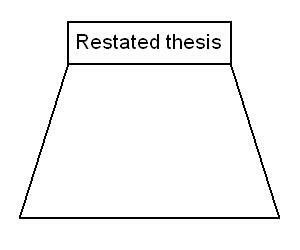 Avoid a dull restatement of your major points. Don't monotonously restate your major ideas; instead, show your readers how the points you raised fit together and why your ideas matter. Also, try to avoid the phrase, “and in conclusion.” This can insult the reader's intelligence: After all, if you've organized your paper well, it will be obvious that you have begun your concluding remarks. Here, a writer circles back to the beginning, returning to the metaphor, image, anecdote, quotation, or example he or she used in the introductory paragraph. Echoing the introduction gives essays a nice sense of unity and completion. This technique moves the reader from the specifics of a paper or essay to a larger, perhaps even universal, point. It redirects the readers, giving them something meaty to chew over. You can demonstrate the importance and broad significance of your topic by using an appropriate analogy, tying the topic to a larger philosophic or political issue, posing a challenging question, or encouraging the reader to look to the future. Especially useful in a persuasive or argumentative essay, in this type of conclusion the writer makes a proposal and/or asks the readers to do something, calling them to action. It is frequently seen in sermons and political speeches. Here, the writer sums up the essay by sketching a scene or by telling a brief anecdote that illustrates the topic's significance. Often, this approach makes an emotional connection with the reader.